The Lipkin study buries XMRV once and for all, completely leaving aside the question of an infectious chimera out and about that contaminates a clean lab in a matter of days and is capable of infecting monkeys. But it wasn’t in the blood of the patients or controls in this study. That much is clear, forgetting the unscientific claim that this study, or any study, is definitive of anything. Science is self-correcting, as Dr. Lipkin reminded us, but only if the game isn’t rigged. This is a repeat performance of the definitive study that showed that the MMR doesn’t cause autism, which also side-stepped the bigger question. The use of the word definitive tells us we are dealing with politics, not science. Sleight of hand. The paper didn’t even try to speculate as to the one positive finding, that 6% of the study group, patients and controls, cross reacted with a test designed to detect SFFV, a nasty murine retrovirus. Whatever it is they are picking up with this serology test, “modified slightly” from the one once used at the WPI, the various PCR’s used in this study, optimized to detect XMRV and a piece of a “generic” pMLV, couldn’t detect it. But that doesn’t mean it isn’t there. The Lipkin study in no way disproves the hypothesis that simple animal retroviruses, alpha, beta and gamma, parenterally introduced, in the form of vaccines and from other sources, e.g. hybridomas, xenografts, etc., have recombined and rescued defective endogenous retroviruses, and/or created new and as yet unrecognized exogenous retroviruses. The existence of XMRV, is supportive of this theory. There have been so many chances for it to happen, in addition to the possibility that it happened naturally. This means that we each may have something a little different. Which is why they can’t find “it”. Personally, as a defender of Dr. Mikovits during this entire mess, I appreciated Dr. Lipkin for openly defending her struggle against the Whittemores. The scientist who put the nail in XMRV’s coffin. Dr.’s Mikovits, Ruscetti and Alter completed the difficult task of acknowledging they’d been mistaken. Our disease has finally been deemed “serious and life threatening” to enable fast tracking of drugs, should there be any drugs worth fast tracking, which seems unlikely if nobody is studying the root cause of the disease, only looking at downstream effects. I’m not even going to question the study design, patient selection, specimen handling, that the patients chose their own controls, etc. I accept at face value that Dr. Lipkin put together a convincing study in order to put the final nail in the coffin about XMRV. No surprise there. I assumed the study would be negative. But I expected the authors to have the intellectual integrity to state that ruling out XMRV does not rule out retroviruses. Instead they allowed the press to distort in predictable ways. I therefore must conclude that Dr. Lipkin plays for the home team. His task was to kill it and reassimilate the renegade scientists into the group. To make sure that nobody does any clinical trials of arv’s, the paper suggests that the patient community has been saved from that terrible fate by this definitive paper. Mikovits’ name right there with Coffin’s. Task accomplished. But even Coffin said that it might be another retrovirus. Smart people allowing distortion and partial truths. It looks to me like we’ve been thrown back on the trash heap. From the Wall Street Journal. Viruses not to blame for chronic fatigue syndrome after all. Thank you Mr. WSJ editor for that headline, suitable for a tabloid. Why do I still believe retroviruses are involved in causation in the face of so much evidence against XMRV? Even though we don’t have XMRV or active replicating virus with some certain degree of sequence homology to a piece of a “generic” pMLV, retroviral causation has not been ruled out. It is still the best explanation for all of the observed phenomena. It works as a clinical model to explain the symptoms and put treatments in context. It even explains the obvious but still unstudied epidemiology. Dr. Mikovits was trying to sequence what she believed were positive cultures that were negative for XMRV. She sent out letters to that effect to patients. Then there is the response to antiretrovirals. Dr. Snyderman has presented amazing data, that most of the scientists involved in this story have seen and ignored. He has not been cured, but his leukemic cells and his cells capable of making cytokines have decreased with treatment. Cancer treated like a chronic disease, like diabetes or AIDS. I don’t think they are stupid, so they don’t want to know. Why not? If the response of longstanding ME/CFS patients to limited arv’s (RTI’s and II’s alone) had been more robust, we wouldn’t even be having this discussion. It wasn’t. There were early responses that were encouraging, but with no way to follow, after a while, you’re left not knowing what is happening. Meaning we don’t know how to use the drugs, not that they have no value. Maybe they should be pulsed or given low dose for N chain termination. Maybe a protease inhibitor is necessary for full effect. Dr. Snyderman is documenting an ongoing response to Kaletra. The best case we heard about anecdotally was a teenager, hadn’t been sick long, responded fully and the drugs were stopped at 6 months, remaining well as far as I know. It is beyond sad that this case was not published. While new teenagers get sick with an “untreatable” disease, they are denied a trial of very safe existing drugs. It could have been studied for a lot less than the 2 million dollars spent to prove it isn’t XMRV. I have tried to discontinue Viread on three occasions, since our drug co-pays are a problem, and I haven’t been able to do it. I get sicker within days and feel better quickly after restarting. Can I prove it? No of course not. The disease is a relapsing remitting illness all on it’s own. However, I didn’t have trouble stopping AZT or Isentress. I have been under enormous stress since June, with one thing after another, one of those times in life when the waves just keep coming, too close together for recovery. I am a little worse than I was, but only a little. I’ve even been able to ride the tandem a couple of times recently, only 5 miles on the flat, but no PEM after. Ali continues to do extremely well on Viread and Isentress. She has considered stopping arv’s, but has decided not to rock the boat at this time, since improvement seems to be continuing very, very slowly. The possible downside besides financial? I don’t know of any for Ali. I’ve aged a lot in the last couple of years, though it is on time, coming after a late menopause, so I can’t really blame Viread for that. I heard from a patient yesterday who did well on AZT, Viread and Isentress for a year, but then went back to baseline for another year with some new symptoms that could have been drug related, though hard to know. As I said, we don’t know how to use these drugs. We have no way to monitor. That doesn’t mean they have no value. I know some in the community –the scientific community—feel that this was not money well spent, but the fact is, I think that we have obviated a lot of, you know, missteps that might have followed with clinical trials and such for antiretrovirals. And in addition, we have been able to establish a sample bank that will be helpful for years to come. And we’ve been able to hold, I think, the attention of the community. This is a complete fabrication. Where are these clinics? It is completely incorrect, and unscientific, to conclude anything from the Lipkin study other than they didn’t find XMRV or a particular pMLV sequence. That’s a long way from no viruses or even no retroviruses in CFS. How is it that 2 million dollars was spent to tell us what we already knew a year ago? No reproducible assay. 2 million dollars and all that effort to prove what isn’t. For three years, we’ve been waiting for the scientific community to run with the ball. Now it is pretty clear, the ball has been dropped, while they huddle to congratulate each other on a job well done. The status quo is restored. The quest for identifying and treating retroviruses that are involved in the pathogenesis or CFS/ME, neuroimmune, autoimmune and neoplastic disorders will not end today despite the negative results of the XMRV, pMLV study. I have CFS/ME and cancer. My data supports the presence and importance of retroviruses in the pathogenesis of both disorders and the potential for anti-retroviral drugs to help us. My data shows the presence of a clonal T-lymphocyte expansion which is probably CD8 cells. 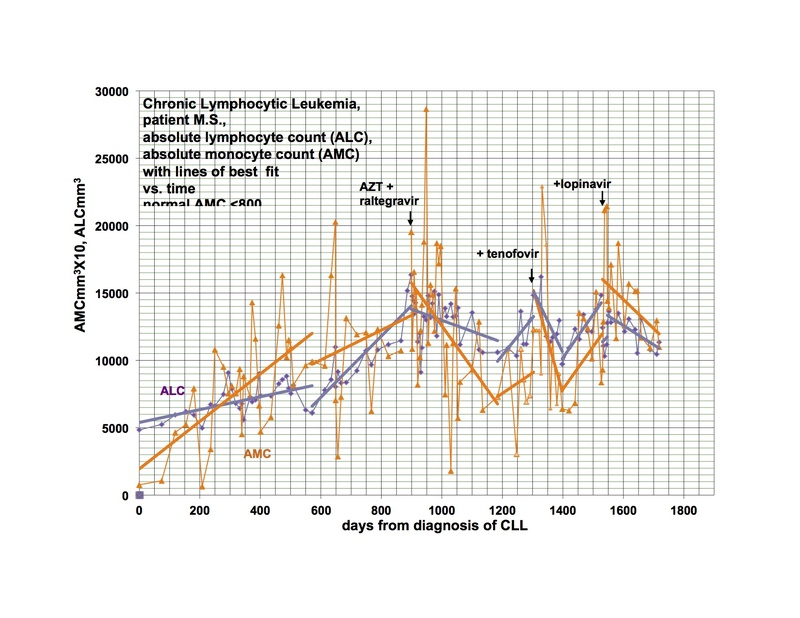 Having a clonal T-lymphocyte expansion is abnormal. In addition, I have increased monocytes (monocytosis). I have looked at 56 of my patients with various types of cancer and half of them also have a detectable T-lymphocyte expansion and monocytosis. My point is that what I see in myself may be a common phenomenon and actually may be happening in millions of people. I haven’t looked in CFS/ME, because I limit my practice to Hematology-Oncology. T-lymphocytes and monocytes are important because they are permissive of retroviral invasion and because they are pre-programmed to make cytokines. Presumably the increased numbers of these cells after infection has occurred would lead to increased amounts of cytokines that would dysregulate the immune system. In addition, monocytes give rise to the microglial cells which migrate to the brain and spinal cord and potentially could deposit abnormal amounts of cytokines in direct proximity to the neural elements. Dr. Lipkin mentioned a polyclonal expansion of B-lymphocytes as important in our type of disorder and this could be a result of the increased amount of cytokines. 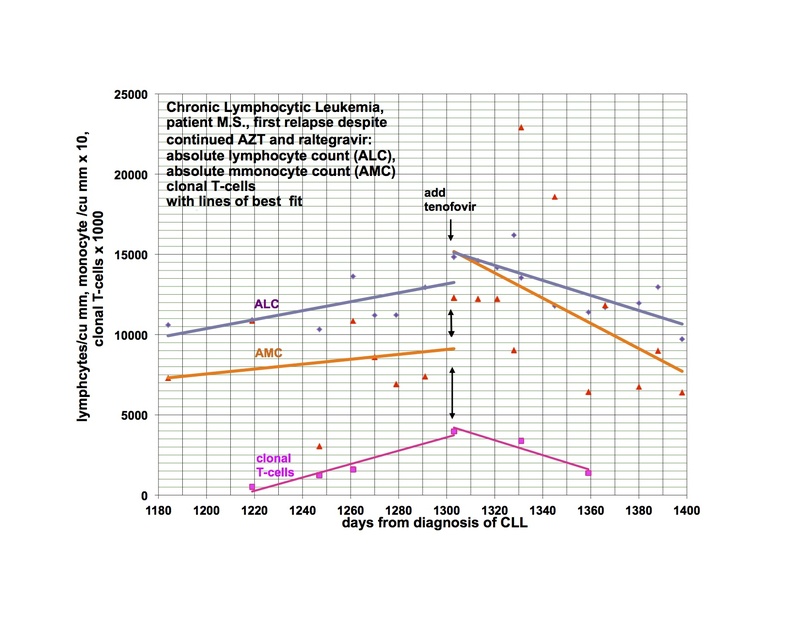 In fact, in my patients who had a clonal T-lymphocyte expansion and/or monocytosis, 50% had autoimmune markers. What is reasonable to postulate is that we now have explained the known connection between inflammation and cancer and neurodegenerative disorders and it all goes back to the retroviruses. I have previously shown response of my leukemia, monocytosis and clonal T-cells to AZT, raltegravir and after relapse a second response to the addition of tenofovir. I had hoped to demonstrate that a PI would be valuable treatment and waited to add this category of drug until relapse. My leukemia responded and relapsed in parallel with the monocytosis and clonal T-cell expansion but at a somewhat different rate. 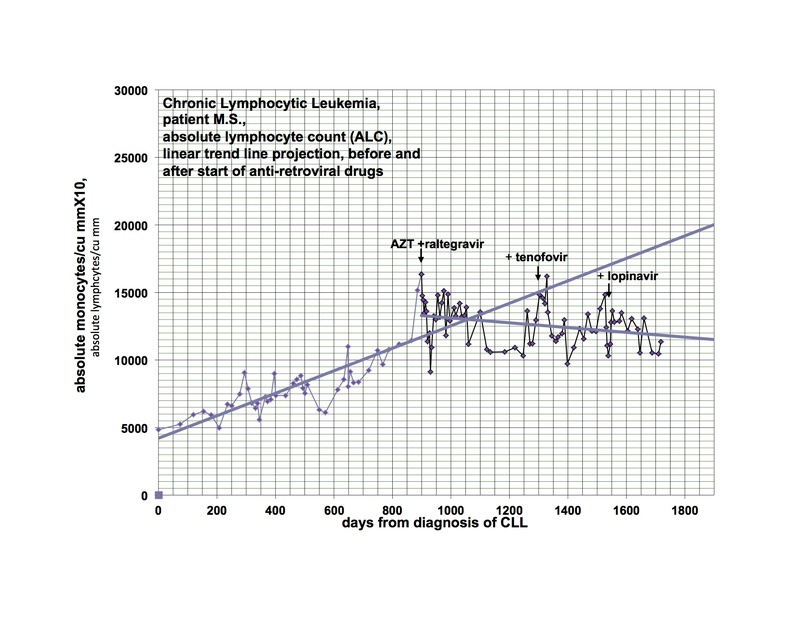 The last graph shows that the clonal T-lymphocytes, CD8 lymphocytes and monocytes were increasing after relapse on AZT, raltegravir and tenofovir. Quest discontinued doing the quantitative TCRγ in 2011. As a favor to me, Quest put it up but with different reagents so that the results from the new assay are not superimposable over 2011’s. Please note that the clonal TCRγ values are a ratio rather than an absolute number of cells. 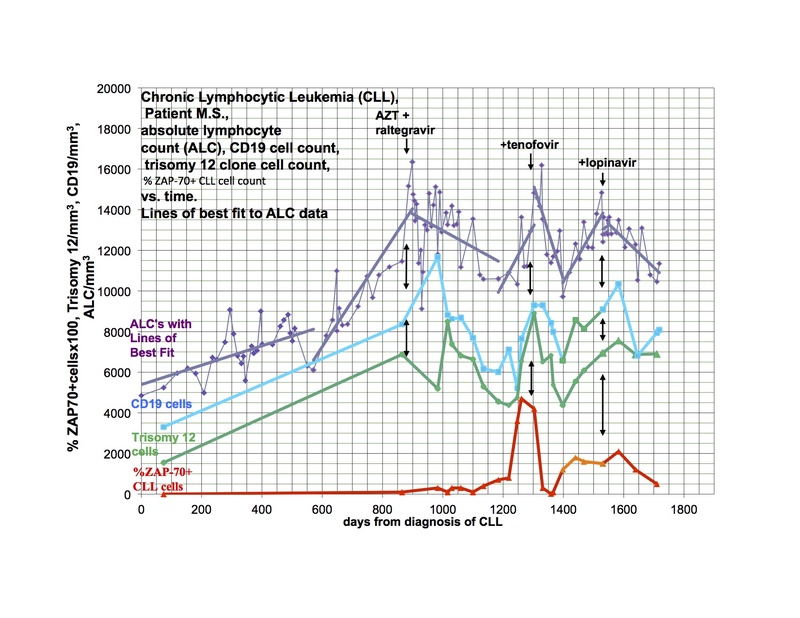 I didn’t have the new clonal T-cell assay available until later in the graph and didn’t think of looking for CD8 cells initially. After the relapse was clearly documented, I added the PI, lopinavir. 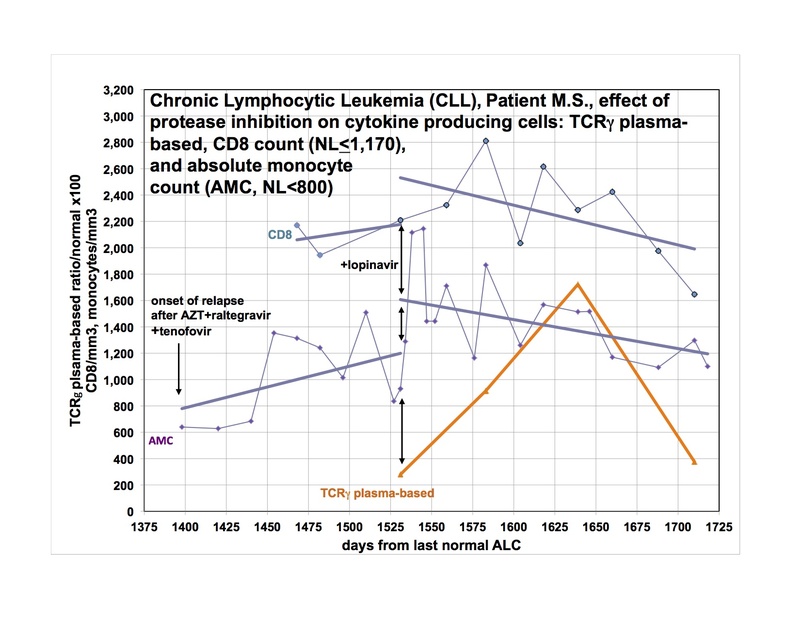 The T-cell parameters and monocytes continued to trend up for the next 4-8 weeks before clearly trending down. The only reasonable explanation for what has happened to me and what I have found in half of my cancer patients is that retroviruses participate in the pathogenesis of our illnesses. Please note that I do not claim that the retroviruses cause the illnesses but emphasize that the retroviruses participate in the pathogenesis. The likelihood is that genetic susceptibility and toxic exposure determines whether an infected person would develop disease and how it would be manifested. It is clear to me from the data I have, that many people have susceptibility to develop disease after infection with retroviruses. It is now up to the scientists to identify the infection and the basis of genetic susceptibility. Once there are easy methods to identify who is infected and with what, treatment trials could be started. We must go forward. It is beyond me that in this day and age this injustice is allowed. I am not a naive person but I had hoped that the 21st Century would bring a greater justice and compassion to the world. How can these corrupt people be able to ruin, mentally, physically and personally an innocent and truly good individual? Me too. It is beyond crazy. A travesty of justice. A misuse of the system. The WPI, a non-profit, spent large amounts of money on lawyers to write hundreds of pages of legal documents, to destroy what was in fact their only resource. To what end? They knew there was nothing to get monetarily. An apology? What a joke. Even if they were right, which they aren’t, what would someone interested in the greater good have done when confronted with the problems that Annette Whittemore was confronted with? In a nutshell, this is where the case stands. The first judge ruled against Dr. Mikovits in a default judgement because she wouldn’t give up her personal email which contained confidential information on many study participants. Then he recused himself to make sure there was no appearance of impropriety, since he had received significant campaign contributions from Harvey Whittemore, who is under indictment for making illegal political contributions and lying to the FBI, not to mention his other business problems: Ex-business partners: Whittemores owe more than $24M. Of course, Harvey claims to have nothing to do with the WPI. So a new judge was appointed. One would have thought that the opportunity would have been seized to right the wrong and run the case as it should have been run in the first place, but no, the judge decided to continue where the old judge left off, leaving the judgement in place, with a “prove up” hearing scheduled for today, to determine an amount, thus forcing the bankruptcy. Meanwhile, back at the ranch, not a peep of anything worthwhile, not a paper, not even a kept up website: Research Studies and Clinical Trials. Just pleas for more money. Perhaps for the CEO’s upcoming defense? Although the piece by Casey Schwartz in the Daily Beast, How Research into Chronic Fatigue Syndrome Turned into an Ugly Fight, had the toned down feel of tight editorial control, it did state that Dr. Mikovits was fired after demanding the commercial lab, VIP Dx, stop selling an unreproducible test. In July 2011 she told Harvey Whittemore of the potential contamination, she says, and expected that the VIP Dx lab would cease testing patients for the XMRV virus. “I just kept saying, stop it, stop it, stop it. We have to sort this out,” Mikovits says. According to Mikovits, the testing did not stop. And after a tense summer, she was fired in September. Let’s not forget what this is really about, not some imaginary IP in some old notebooks, but the thousands of bogus tests that were sold, some after they knew they were bogus, some paid for by Medicare? The fall out from it all? The WPI’s legacy, from an advocate of 20 years, posted to FaceBook last night and republished with permission. Just because of money legitimized?